Nearly 40 years ago, on 20 August 1977, the Voyager 2 space probe was launched from Cape Canaveral, Florida, on a mission to study the Solar System’s four outermost planets. It was followed 15 days later by the launch of an identical spacecraft, Voyager 1. Although Voyager 1 was launched after Voyager 2, it followed a different path which meant that it actually visited its first target, the planet Jupiter, four months earlier. 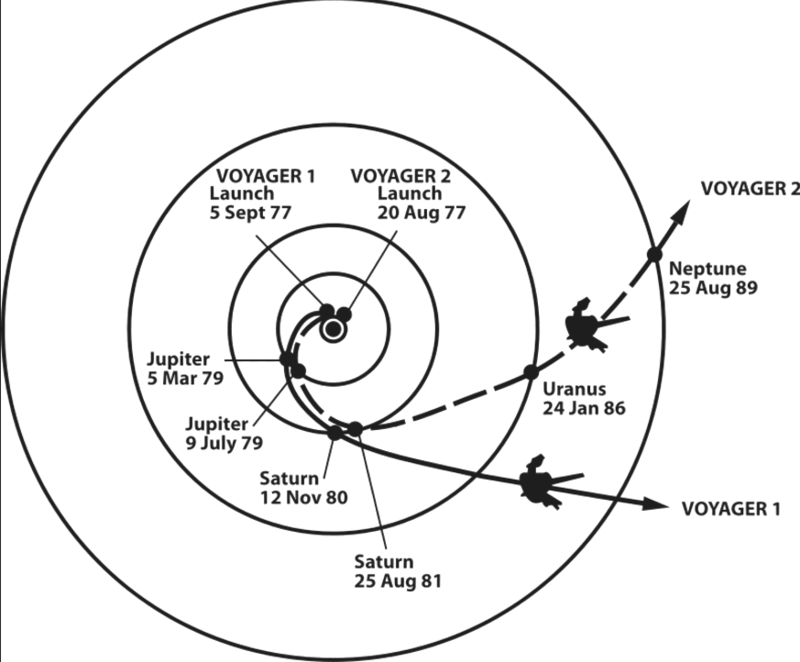 The diagram above shows the trajectory of the Voyager spacecraft. The first targets, the giant planets Jupiter and Saturn, had previously been visited by NASA’s Pioneer 10 and 11 spacecraft, but the Voyagers had better instruments and were able to take more accurate observations. 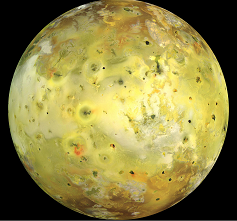 Among the discoveries made by Voyager was that Io, one of Jupiter’s moons, has a number of active volcanoes. This made Io the first place other than the Earth where volcanoes had been seen to erupt. Voyager 1 passed close to Saturn’s giant moon Titan. Titan is 5,150 km in diameter, nearly twice as large as the Moon, and is in fact slightly larger than the planet Mercury. It is the only moon in the Solar System with a thick atmosphere, which surrounds it with a dense haze hundreds of kilometres deep, making it impossible to see any surface details. 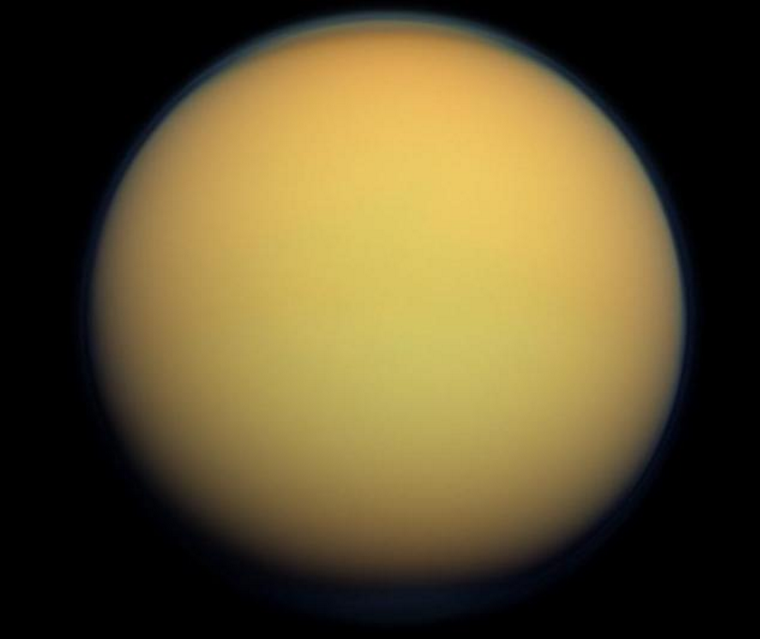 At Titan’s surface the atmospheric density is roughly 5 times greater than the Earth’s at sea level. Voyager 1 discovered that it consists mainly of nitrogen (98.4%) and methane (1.4%) with trace amounts of other gases such as ethane. These discoveries led to speculation that, like Earth, Titan has complex weather patterns. Being so far from the Sun, Titan’s surface is very cold, around minus 180 degrees. This temperature is near the boiling point of hydrocarbons such as ethane and methane, which on Earth are found in natural gas. Voyager 1’s discoveries suggested that on Titan it rains liquid hydrocarbons in a similar way to how it rains water on Earth and that there were lakes of liquid hydrocarbons on Titan’s surface. A later mission by the spacecraft Cassini to Saturn and its moons did indeed detect many lakes of liquid methane on Titan (NASA 2016). After passing Saturn, Voyager 2 visited the two outermost planets Uranus and Neptune (shown below). Uranus and Neptune are of similar size and are both much smaller than the gas giants Jupiter and Saturn. They are mainly composed of frozen water, ammonia and methane and are sometimes called the “ice giants” So far Voyager 2 is the only mission to have visited the ice giants and most of what we know about Uranus and Neptune came from this spacecraft. No further missions to Uranus or Neptune are planned. Although it is possible that a mission to the ice giants could be launched by NASA in the the 2030s (Clark 2015), this is very much at the proposal stage. I think that this won’t happen, given the high cost of space missions and other higher priority targets such as exploring Mars. After completing their primary mission to study the outer planets, the Voyagers left the Solar System. They are still in contact with Earth and are now sending back data about interstellar space. For more details on this part of the Voyagers’ mission click here. 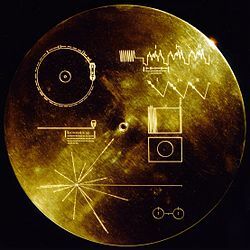 Each Voyager contained a golden record, the cover of which is shown below. The purpose of the golden record was twofold. 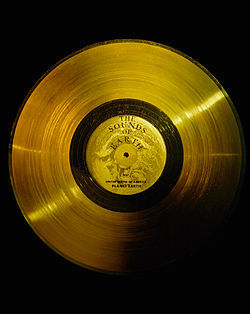 If either of the Voyager spacecraft were ever found by an alien intelligence in the far future then, as I’ll explain later, from the golden record cover they would be able to work out the location of the Sun within the galaxy and, by playing the record, get some information about the sounds and sights of Earth in the 1970s. If you look at the bottom left hand corner of the golden record cover there is a small circle with 15 lines coming out of it. This is shown in more detail in the diagram below. This diagram was also put on a plaque on the earlier Pioneer probes and was devised by Frank Drake (1930-), who has been heavily involved in the search for extraterrestrial intelligence (SETI). 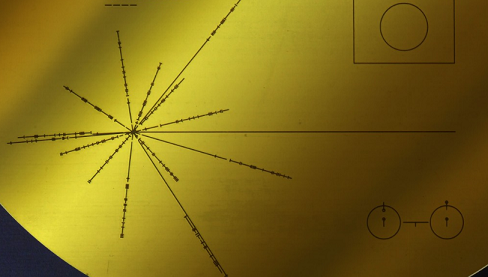 The centre of the diagram, from which the lines radiate, represents the Sun. The right-hand end of the longest line (at 3 o’clock) represents the centre of the galaxy. The end of each of the remaining lines represents an object called a pulsar and the length of the line between the Sun and the pulsar represents the distance to the pulsar. Pulsars are rapidly rotating objects which emit radio waves in regular pulses a few seconds or fractions of a second apart. Each pulsar has its own distinct interval or period between pulses and the marks drawn on the lines depict the length of the pulsar period not in seconds but in multiples of a fundamental time unit that an alien might understand (see note below). The alien civilisation could then have sufficient information to identify the fourteen pulsars and the distance of the Sun from each pulsar, and thus work out the location of our Solar system. On the upper part of the golden record cover is a picture of the record itself plus instructions for playing it. 116 pictures of a variety of objects such as the planets in the solar system, human anatomy, groups of children, important landmarks, interesting places, and man-made structures such as airports, large telescopes, the Golden Gate Bridge in San Francisco, and an American highway in the rush-hour. Where are the space probes now? As well as the two Voyagers, three other spacecraft have been launched on a trajectory to take them out of the Solar System. They are New Horizons, which passed the dwarf planet Pluto in 2015 and Pioneer 10 and 11, which were the first spacecraft launched to leave the solar system. As you can see from the table, the Pioneer spacecraft are no longer in contact with Earth. There are two possible reasons for this: either their power supply has run out, or the radio transmitter is no longer lined up with the Earth and is beaming out signals in a completely different direction. 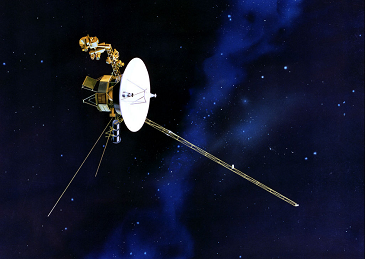 The Voyager spacecraft are still in contact and should have enough power to continue transmitting messages back to the Earth until the mid 2020s. In the table, the distance of the probes is given both in kilometers and astronomical units (AU). 1 AU is the average distance from the Earth to the Sun and is equal to just under 150,000,000 km. 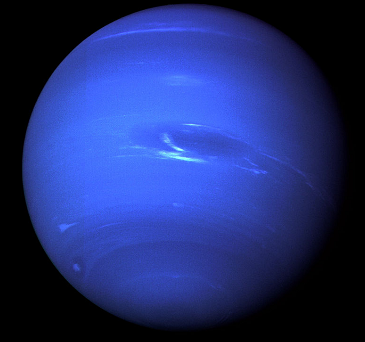 The outermost planet Neptune is about 30 AU from the Sun and the nearest star about 250,000 AU away. The speed column shows how fast the spacecraft is moving away from the Sun in AU per year. Will the Voyagers ever be found? Even astronomers who think that alien life is widespread within our galaxy think that it is very unlikely, given the vastness of space, that the Voyager spacecraft will ever be found. The spacecraft are small and their power sources will have long died, thus making them unable to transmit a signal which could be picked up. However if they were ever to be intercepted by an alien civilisation it is fascinating to think what they would make of them. Clearly units of time such as hours, minutes and seconds, which have been invented by humans, would be meaningless to an alien. Atomic hydrogen is the most common element in the Universe and Drake used the transition of a hydrogen atom, shown on the bottom right hand corner of the record cover, to create a “fundamental time unit” which he hoped an extraterrestrial race would understand. When a hydrogen atom flips from one state to another it emits radio waves at a frequency of 1,420,406,000 waves per second, a fact that any advanced civilisation would be well aware of. So each individual wave corresponds to a time interval of 0.000 000 000 704 seconds. All the pulsar periods are expressed in multiples of this fundamental time interval. Clark, S (2015) Uranus, Neptune in NASA’s sights for new robotic mission, Available at: https://spaceflightnow.com/2015/08/25/uranus-neptune-in-nasas-sights-for-new-robotic-mission/ (Accessed: 15 June 2017). NASA (2016) Cassini explores a methane sea on Titan, Available at: https://www.nasa.gov/feature/jpl/cassini-explores-a-methane-sea-on-titan (Accessed: 15 June 2017). I still remember the excitement of following the Voyager rendezvous with Jupiter. Thanks for the update. It is interesting to think that most people alive today weren’t even born when it happened. I love the Voyager program. Thanks for this great post. As you know, Carl Sagan was a once-in-a-generation scientist who could make research both understandable and exciting to the lay public. He hosted the most popular science television show of its time (“Cosmos”). Jon Lomberg was the principal artistic collaborator of astronomer Carl Sagan. From 1972 until Sagan’s death in 1996, Lomberg illustrated most of Sagan’s books and magazine articles, and he was Chief Artist for Sagan’s classic television series. I bought one of the remaining original acrylic on canvas paintings from Jon Lomberg’s collection. This is a study for the painting “Portrait of the Milky Way”, commissioned by the National Air and Space Museum of the Smithsonian Institution for its gallery “Where Next, Columbus”. This study, painted in acrylic on canvas in the winter of 1991, was the final approval study created by the artist for review by the curators of the gallery. It was intended to show the final combination of materials, palette, techniques, composition, and “feeling” that the artist would use in the final 6′ x 8′ canvas. The curators of the exhibit were quite pleased with this study and approved it.